Back in 1978, Space Invaders wowed the world with its simple but addictive gameplay. In 2008, can Space Invaders Extreme entertain a whole new, more sophisticated gaming audience? 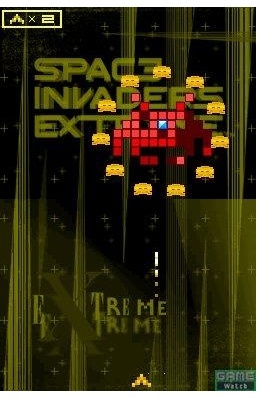 It's scary to think that Space Invaders Extreme is actually a remake of the very first computer game I ever played. It was on a green-screened Apple 2 computer, borrowed from my dads workplace, back in the early eighties when I first sampled the delights of Space Invaders. Back then, blasting columns of blocky green space aliens as they advanced ever closer to the bottom of the screen was pretty much the pinnacle of computer entertainment. Games have come on a long way since then however, so can the insidious invaders still delight today's gamer the way they thrilled the computers and arcades of yester-year? Playing Space Invaders Extreme for the first time may be overwhelming for those of you who expected a remake of the sedately paced arcade classic. This is certainly still space invaders, the invaders still move from left to right, edging closer to the bottom of the screen. Apart from being different colours and occasionally much larger, the invaders even look the same as they did all those years ago. The first major change gaming veterans will notice is that the beeps and clicks are gone, substituted for a psychedelic mix of upbeat trance, which cleverly mixes in with the sound of your shots as you fire them. Also new are the backgrounds, which swirl and pulsate along with the game play like a 90's dance video. In fact the animated backgrounds might be too much for some players, luckily they can be turned off if found to be too distracting. The space invaders themselves have a few new tricks up their sleeves. Some carry shields that take multiple hits, others will swoop down to the bottom of the screen and some have improved weaponry. Luckily the invaders aren't the only ones with new hardware. Power ups now frequently fall from the slain space invaders and give you all kinds of new weapons, from powerful bombs to wave destroying lasers. So, with your new found powers you cut your way through wave after wave of invading aliens, occasionally popping off one of the big point bonus UFO's that fly across the top of the screen. Clear several waves and an end of level boss will appear on the top screen. This is usually one very large space invader that must be destroyed by gradually shooting away pieces of him, while avoiding his return fire and that of his guardian subordinates.